Fig. 1. Dicentric formation by FLP-mediated unequal sister chromatid exchange. (A) Recombination between inverted FRTs (gray half-arrows) on replicated sister chromatids produces a dicentric chromosome and an acentric fragment. (B) An acentric fragment (arrow) and a truncated dicentric chromosome (arrowhead) can be seen after FLP recombination on the X chromosome. (C) A dicentric bridge spans the two poles of division in anaphase, whereas the acentric fragment (arrow) fails to segregate. High-efficiency dicentric chromosome formation has been used to address several questions related to chromosome function. 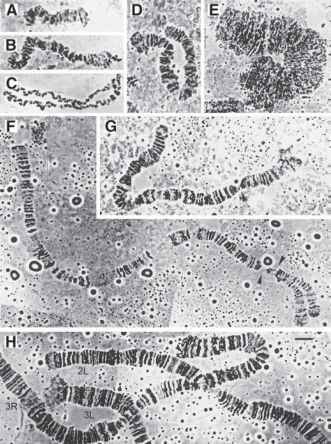 Dicentric formation on a nonessential, marked Y chromosome was used to analyze the operation of cell cycle checkpoint responses to the single double-strand break produced by mitotic breakage of the dicentric (4). The chromosomal specificity of the double-strand break allowed clear determination of the features of cellular responses, separable from the consequences of aneuploidy that are invariably associated with the induction of DNA damage by random methods. Other experiments have focused on the distal acentric fragment for the analysis of chromsome segregation. Chromosomal material separated by radiation-induced chromosome breakage from a very small minichromosome exhibits centromere activity, but the distal portion of a normal X chromosome (released by site-specific recombination) does not (1). A similar system was used to show that the bwD heterochromatic satellite block does confer weak centromeric activity to a released acentric fragment (2). All of these studies used existing P-element insertion lines and markers to construct strains suitable for the intended dicentric experiment. The following protocols outline the development and characterization of a strain competent for dicentric formation. A particular example, beginning with a single FRT-bearing P-element insertion on chromosome 3 is presented. A similar protocol can be developed for any insertion of an FRT-bearing construct, using appropriate balancer strains. The rationale for various steps is included in Subheading 4.